The smoke is impacting air quality and visibility, and is expected to continue this way through the rest of Thursday afternoon and evening. KUSA — The wildfire smoke that you can see and even smell on the Front Range of Colorado is mostly coming all the way from California. The Carr Fire raging in California has destroyed more than 1,000 homes and is considered one of the most brutal in the state's history. More than 4,000 firefighters are battling the blaze that has killed six people, including two firefighters. The smoke from that fire and others burning in Oregon, Nevada and Utah, as well as some small local fires here in Colorado, is impacting air quality and visibility and is expected to continue this way through the rest of Thursday afternoon and evening. A strong jet stream is pushing wildfire smoke from the west coast into the middle of the country. A ridge of high pressure centered over the desert southwest is guiding the smoke around it, and right into Colorado from the northwest. The wildfire smoke in this stream can be seen all the way in the Midwest states. The air quality index in the Denver area has been holding in the moderate range, but could spike enough later on Thursday for an air quality advisory. The forecast is for it to remain moderate. 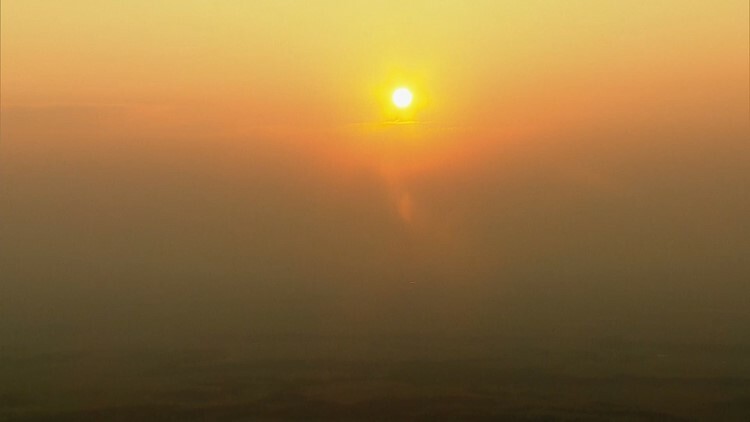 The Colorado Department of Public Health and Environment has issued an air quality health advisory for the western slope through Friday morning. Monsoon moisture is also being pulled in around that same ridge, so some parts of Colorado could get some brief relief with some rain showers, though the storms are expected to be very scattered Thursday. A stronger shortwave trough in the jet stream should arrive by Friday afternoon. That should increase rain shower activity and alter the wind pattern enough to clear up the wildfire smoke significantly.